The Fuller’s Head of the River Fours takes place over the world famous 4 ¼ mile Championship course from Mortlake to Putney on the River Thames in West London for the 59th time on Saturday, 30 November, starting at 1 p.m. Heading for the start in 2012. Photo: Tim Koch. Demonstrating the truly inclusive nature of competitive rowing, the race includes men and women of all backgrounds and abilities, from across the UK, Europe and further afield. The Fuller’s Head of the River Fours offers a rare opportunity for members of the GB national team to compete in club colours and on home waters. Starting as No.1 is the top Leander quad scull containing two members of the World Championship bronze medal winning crew. Starting directly behind them is an “All stars” crew from Tideway Scullers School, led by Britain’s Olympic bronze medallist, Alan Campbell, the crew incudes reigning World single scull champion Ondrej Synek from the Czech Republic, reigning Quad Scull world champion, Valent Sinkovic from Croatia and Aleksander Aleksandrov of Azerbaijan who took the 2013 Diamond Challenge Sculls at Henley. Last year's Tideway Scullers I, who placed 2nd: A. Aleksandrov, A. Campbell, L. Moon, T. Male. Photo: Tim Koch. In the men’s coxed four event Leander’s top boat includes Olympic champions Pete Reed and Alex Gregory. They are joined by Tom Ransley, Will Satch and cox Phelan Hill from the world championship winning men’s eight. They will be pushed by a very strong Isis boat containing the stroke of the GB Olympic bronze medal winning men’s eight, Constantine Louloudis, along with double Olympic medallist, Canada’s Malcolm Howard and two experienced senior internationals, USA’s Mike DiSanto and GB’s Karl Hudspith. In the women’s elite events World Champion Polly Swann is joined by three of the GB women’s eight which finished 4th at the World Championships this summer racing as Leander in a coxless four. In the women’s quad sculls the Leander “B” crew includes Jess Leyden who became the first British woman to win an open weight world championship single scull gold when she won the Junior title in Lithuania earlier this year. 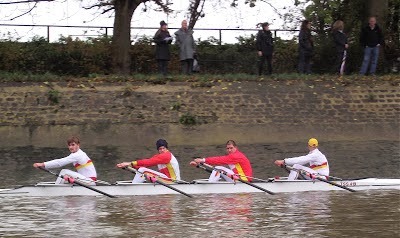 The Fuller’s Head of the River Fours also offers the first chance for the 2014 Oxford and Cambridge Boat Race squads to test themselves against each other in open competition. Both the Oxford University men’s team (racing as Isis) and the Cambridge University men’s team have entered five crews with the top boats from each racing in the Elite Coxed Four division. The Oxford and Cambridge Universities women’s Boat Race squads are also taking to the Tideway with Cambridge racing seven crews to Oxford’s three. The Fuller’s Head of the River Fours has always provided a great opportunity to see up and coming talent in the sport, 19 of the Great Britain U23 squad will be competing, as will 17 of the 2013 Great Britain Junior squad. They will be joined by many of the UK’s top club, school and university rowers – all of whom will be hoping to win one of the 21 pennants on offer and a place at the HOR4s prize giving in the Fuller’s brewery in Chiswick. Good support from Hammersmith Bridge in 2012. Photo: Tim Koch. It is estimated that it will take the crews between 17 and 30 minutes to go down the course depending on weather, fitness and skill. The organisers and competitors will be keeping their fingers crossed for good weather, to avoid a repeat of the last minute 2009 cancellation due to poor conditions. Spectating along the whole course is free, the action will last a couple of hours and there are plenty of good viewing points from which to watch. Stalls selling refreshments and rowing related goods will be located outside many of the local Tideway clubs, especially along Putney Embankment and near Hammersmith Bridge. Fuller’s Brewery has now been associated with this event for 33 years, for which the committee and all those involved with the race express their heartfelt thanks. Whether you are eating turkey or not today ~ Happy Thanksgiving! The prestigious William Hill Sports Book of the Year is an annual British award for excellence in sports writing. This year’s prize is open to any full-length book on a predominantly sporting subject published for the first time in the UK between 28 September 2012 and 27 September 2013. It started in 1989 when the winner was True Blue: The Oxford Boat Race Mutiny by Dan Topolski and Patrick Robinson. A book on rowing has not won since but this year there is a strong contender that has made it from the ‘longlist’ of seventeen to the shortlist of six: The Boys in the Boat by Daniel James Brown. As our review shows, it is already the HTBS Book of the Year. A William Hill spokesman said: “As befits the 25th anniversary of the world’s undisputed finest award for sports books and their authors, I do not believe we have previously seen a year produce such an abundance of top quality titles. The judges face their toughest task yet in initially creating a shortlist then deciding on a winner—which will have beaten a classic field to be declared champion”. The winner of the £25,000 prize will be announced live on BBC Radio 4’s ‘Front Row’ arts programme on Wednesday 27 November at 7.15 p.m. GMT. *Bookie: Slang for one who takes bets such as the sponsors, William Hill PLC. The winner is…… Jamie Reid’s Doped. Extracts from the six shortlisted books are here. 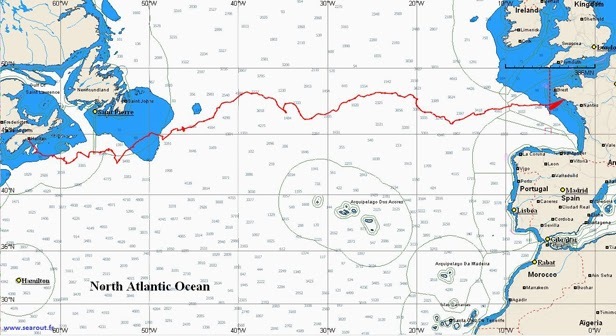 After 129 days at sea in her seven-metre rowboat Hermel, at 11:09 a.m. local time on 12 November, Mylène Paquette arrived to her destination Cité de la Voile Éric Tabarly, Lorient, in France. 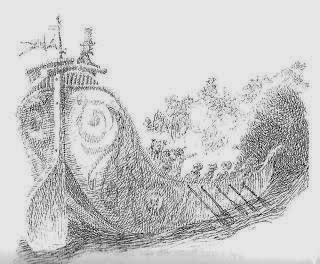 Hermel had then carried her almost 2,700 nautical miles (5,000 kilometres) across the Atlantic from Halifax, Canada, to the French northwest coast. 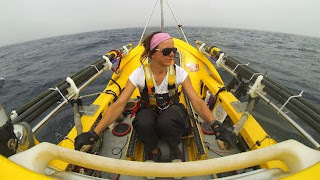 Mylène, from Montreal, is the first North American woman to solo row across the Atlantic. Hélène Rémond wrote about this brave woman, who, believe it or not, has aquaphobia (fear of water), on 2 October on HTBS. During her four-month voyage on the Atlantic Ocean, her boat capsized several times and she saw enormous waves crashing over her boat while she locked herself in the small cabin of the boat. At one point she spent almost six days strapped to her bed, she told an interviewer for the blog C.G. Compass. After living in these cramped conditions, Mylène had problems walking on land when she reached France. Read the whole article in C.G. Compass here. Thanks to Hélène who pointed us in the direction of the C.G. Compass blog. The coxed pairs final at the 1948 London Olympics. Denmark beat Italy and Hungary on Henley Reach. Regular HTBS readers will know that we are big fans of Jack Wilson, Ran Laurie, Bert Bushnell and Richard Burnell. All four of these men had distinguished rowing careers but arguably the highlight for all of them was winning Gold at the 1948 London Olympics. Wilson and Laurie won the coxless pairs and Bushnell and Burnell won the double sculls. 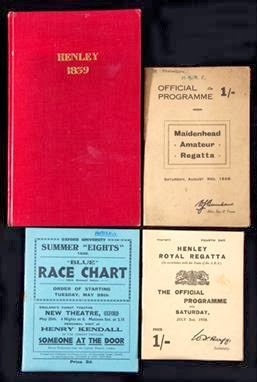 The winners in the five other events at the Olympic Regatta at Henley were Merv Wood of Australia in the single sculls, Denmark in the coxed pairs, Italy in the coxless fours, and the United States in the coxed fours and the eight. While I was aware that Britain also came second in the eights, I had no knowledge of any other entries from the host country – until recently. A young women who is learning to row at my club casually mentioned that she thought her grandfather had ‘won something rowing in the 1948 Olympics’. I quickly established that he was not Bert or Dickie, or Ran or Jack. It turned out that he was in the third of the two man boats that Britain had entered: the coxed pair. Sadly, it did not win and in fact came eighth out of nine boats. The British entry for the coxed pairs at the London Games in 1948, Walker, Scott and James. ‘Granddad’ turned out to be bowman Howard (Bakie) James, aged 24. Stroke was Mark Bodley Scott, aged 25, and the cox was 16-year-old David Walker. All were from Thames Rowing Club. In round one, they were the second of three but in the repechage they lost to the eventual winners, Denmark. There is an nice interview filmed in 2012 with stroke Scott on YouTube. 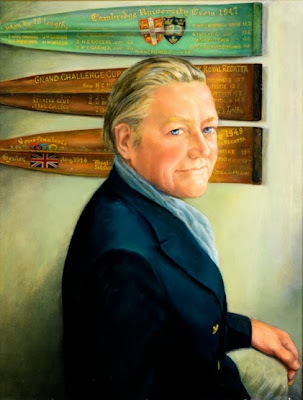 In it he says that they were given ‘a little bit of coaching by a fairly elderly gentleman’ and the impression is that they were very much an afterthought following Laurie and Wilson, two of the finest rowers of the pre war period, and Bushnell and Burnell, both of whom showed promise (Dickie had won the Wingfield Sculls in 1946 and Bushnell in 1947) and who had the great Jack Beresford as their coach. The coxed pair is the heaviest of all racing boat classes with only two rowers to carry the weight of the cox. It needs two big and strong people to make it move fast but, like the coxless pair, it is vital that they row in the same way. Two otherwise good rowers who have different styles are unlikely to make it work. This need for total teamwork means that the cox is often redundant as a steersman. There is a story that when Steve Redgrave and Andy Holmes were training for the coxed pair in the 1988 Seoul Olympics, cox Pat Sweeney was sometimes not available so they replaced him in training with a heavy tool box. The new cox was the quiet type. In modern times the coxed pair was never a popular boat at club level in Britain – in fact, I cannot remember ever seeing one. At the top level, it was dropped as an Olympic event after the 1992 Barcelona Games – but at least it had a magnificent finale. The Italian brothers Carmine and Giuseppe Abbagnle were the firm favourites to win the Olympic Coxed Pairs final on Lake Banyoles on 2 August 1992. They were seven times world champions and one of the great crews in rowing history. At 1000 metres they led by four and a half seconds, the Romanians were second and the British Searle brothers, Greg and Jonny with cox Garry Herbert, were third. With two hundred metres to the finish the Searles had moved up to second place but were still more than a length down on the Abbagnles. The BBC commentator said: ‘Surely it’s too far even for the Searles with their finishing power...’ In the next 25 strokes the British pair went from a boat length down to win by half a length. If you could not watch it on YouTube, you would not believe it. The River & Rowing Museum in Henley-on-Thames has appointed a new chief executive to succeed Paul Mainds who, after 14 years at the museum, will retire. 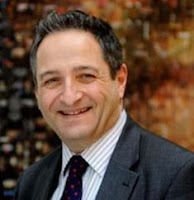 Starting on 1 January 2014, the new chief executive is Ludo Keston (on the right), who will move from the Coventry Heritage and Arts Trust in Coventry. Keston, 54, who lives in Stratford-upon-Avon with his wife and their three children, is a former general manager of the Royal Shakespeare Company and has also worked for the York Theatre Royal and the New Vic Theatre in Staffordshire. He was educated at Maidenhead Grammar School and then studied at the London Academy of Music and Dramatic Art. In 2012, the River & Rowing Museum had 117,000 visitors and was named one of the top 50 museums in the world by the newspaper The Times. 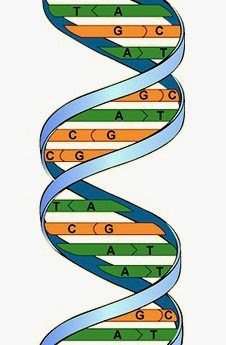 There’s a very good reason why I didn’t get homework during school half-term holidays; I didn’t get half-term holidays! However, things are different for no. 1 daughter who was given plenty of homework during her recent autumn half-term break. One of her tasks was to select a poem, write it out, memorise it and be able to recite it to her class on her return to school. Perhaps to curry favour with yours truly, the poem she selected was "The Rowing Song" (a poem) by Roald Dahl. What’s more, she also suggested I do a blog post for HTBS about it! Dahl (1916-1990) was born in Wales but both his parents were from Norway. The family used to spend the summer holidays on a little Norwegian island, swimming, fishing and getting about by boat. When Roald was four years old, his father died, so his mother had to organise the trip alone for herself and her six children. Perhaps this is where the inspiration for "The Rowing Song" came from. 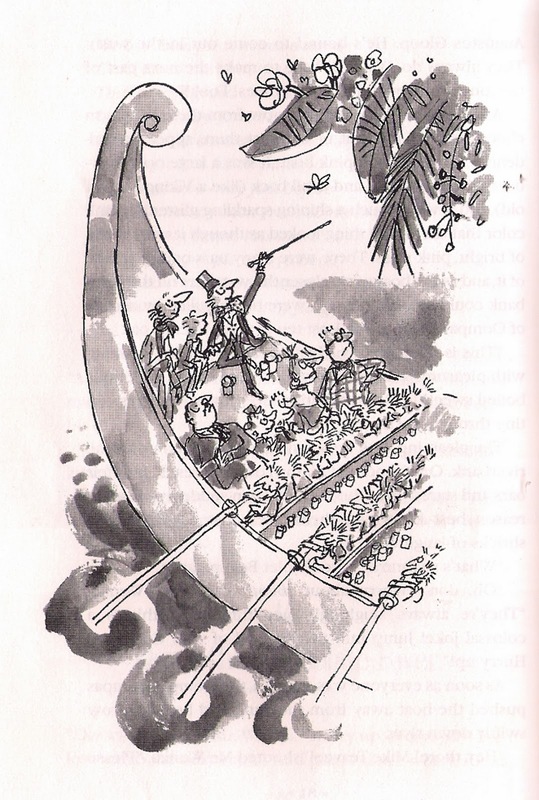 The Oompa-Loompas in rowing action as illustrated by Joseph Schindelman (1964). Everyone has their favourite Roald Dahl book. In our house, Matilda, James and the Giant Peach, George’s Marvellous Medicine and The Twits vie with Charlie and the Chocolate Factory (1964) for top billing. 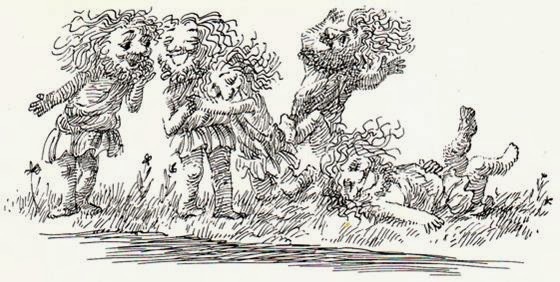 It is in the latter that "The Rowing Song" can be found (chapter 18, Down the Chocolate River), but before we come to the poem, we are introduced to the Chocolate River and the boat in which the central characters are about to ride. A steamy mist was rising up now from the great warm chocolate river, and out of the mist there appeared suddenly a most fantastic pink boat. It was a large open row boat with a tall front and a tall back (like a Viking boat of old), and it was of such a shining, sparkling, glistening pink colour that the whole thing looked as though it were made of bright, pink glass. There were many oars on either side of it, and as the boat came closer, the watchers on the riverbank could see that the oars were being pulled by masses of Oompa-Loompas – at least ten of them to each oar. The gleaming pink boiled-sweet boat glided up to the riverbank. One hundred Oompa-Loompas rested on their oars and stared up at the visitors. Then suddenly, for some reason best known to themselves, they all burst into shrieks of laughter. 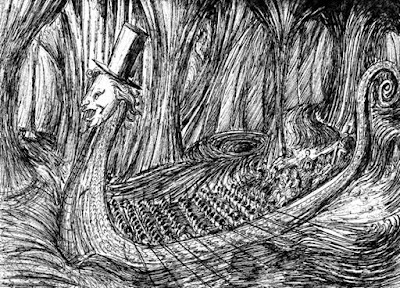 Once everyone is aboard, the boat is rowed downriver by the Oompa-Loompas, heading for ‘The Inventing Room’. On the way the river narrows before entering a tunnel. The boat sped on down the river. The river was getting narrower. 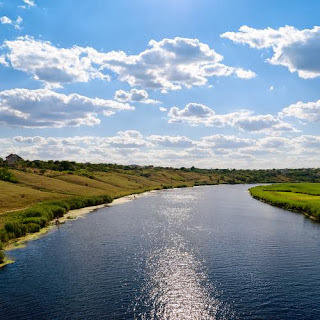 There was some kind of a dark tunnel ahead – a great round tunnel that looked like an enormous pipe – and the river was running right into the tunnel. And so was the boat! “Row on!” shouted Mr. Wonka, jumping up and waving his cane in the air. “Full speed ahead!” And with the Oompa-Loompas rowing faster than ever, the boat shot into the pitch-dark tunnel, and all the passengers screamed with excitement. “How can they see where they’re going?” shrieked Violet Beauregarde in the darkness. “There’s no knowing where they’re going!” cried Mr. Wonka, hooting with laughter. Which direction they are going! Or which way the river’s flowing! 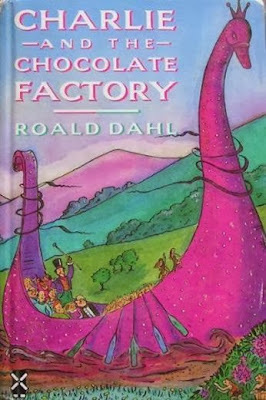 The book was adapted into two major motion pictures: Willy Wonka & the Chocolate Factory in 1971 and Charlie and the Chocolate Factory in 2005. 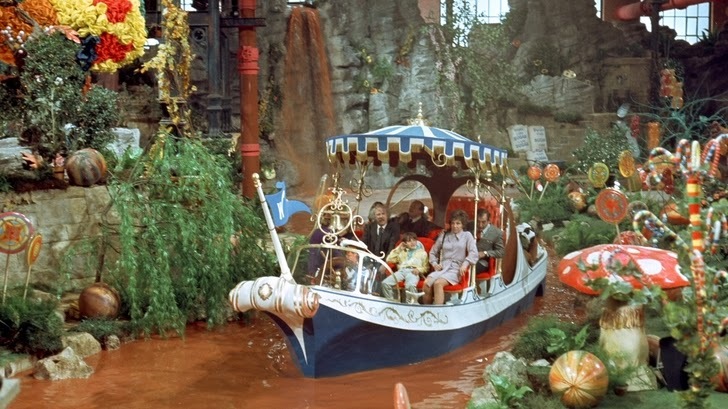 The Boat Ride – Willie Wonka & the Chocolate Factory (1971). In the original movie, the song, now with additional lines (see below), is sung by Willy Wonka played by Gene Wilder as the children and their parents/grandparents take a horrifying, psychedelic ride with Willy Wonka on his boat. Unfortunately, the boat has been changed to a paddle boat and the Oompa-Loompas are nowhere near an oar. The Boat Ride – Charlie and the Chocolate Factory (2005). In the second film adaption, the boat is as described in the book but the song is omitted except for the line “There’s no knowing where they’re going!” which is uttered by Willy Wonka, played by Johnny Depp. 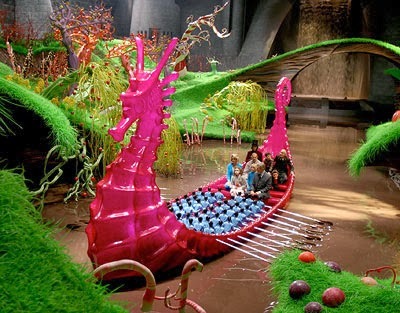 A group of blue-clad Oompa-Loompas (all played by diminutive actor Deep Roy, who was further miniaturized and multiplied digitally) man the oars on a seahorse-shaped galley traversing the factory’s Chocolate River. Wonka tells the kids not to lick the boat, because then it will get sticky. The Oompa-Loompas slowly row the boat further down the Chocolate River, entering a dark tunnel. Wonka switches on the lights and the boat travels rapidly down a windy tunnel, passing strange rooms on either side. Finally, they reach the Inventing Room, where Wonka tells the Oompa-Loompas to stop. You can compare the two scenes by clicking here (1971) and here (2005). The 1971 film was a great disappointment to Roald Dahl. Deviations from the book irritated the author, who would have preferred Spike Milligan in the title role. In 2005, the BBC even went as far as to refer to his ‘hatred’ of the original movie. However, he had been involved in the movie and had rewritten "The Rowing Song" for it and the following is the full version recited by Gene Wilder. Changes from the original are in bold. The first two lines are taken from the poem "Homeward Bound" by William Allingham published in A Round of Days (1866). Charlie and the Chocolate Factory was first published in the USA by Alfred A. Knopf, Inc. in 1964 and in the UK by George Allen & Unwin in 1967. It had taken Dahl four years of writing and editing to get it into its published form. The Roald Dahl Museum and Story Centre has in its archive the various manuscripts and typescripts (the story in the early drafts of Charlie and the Chocolate Factory) produced between 1961 and 1964. Originally, the Oompa–Loompas were a tribe of 3,000 amiable black pygmies who have been imported by Mr. Willy Wonka from ‘the very deepest and darkest part of the African jungle where no white man had been before’. In 1972, an attack on the book was published by American writer Eleanor Cameron and the political agenda of the story finally began to be debated. The Oompa-Loompas redrawn by Joseph Schindelman, 1973. Perhaps the best known and most loved illustrations of Roald Dahl’s books have been drawn by Quentin Blake. The boat scene as illustrated by Quentin Blake (1998). 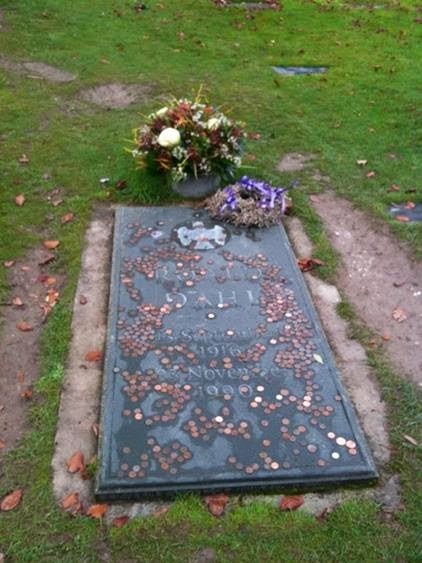 Roald Dahl died on 23 November 1990, at the age of 74, and was buried in the cemetery at St Peter and St Paul's Church in Great Missenden, Buckinghamshire, England. According to his granddaughter, the family gave him a “sort of Viking funeral”. 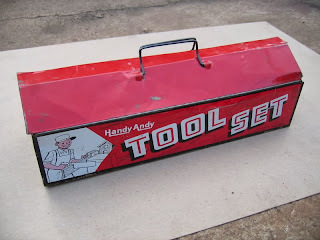 He was buried with his snooker cues, some very good burgundy, chocolates, HB pencils and a power saw. Roald Dahl’s gravestone, St Peter and St Paul’s Church, Great Missenden, Buckinghamshire. Photo: Greg Denieffe. Matt Chapman, a visual artist living in the Bloor West Village area of Toronto, has recently produced personal illustrations for Charlie and the Chocolate Factory. I like the fact that it is in keeping with the text and that the Viking aspect is prominent. I think Roald Dahl would have liked it too. Editor's note: a special 'thank you' to "No. 1 Daughter Denieffe"! 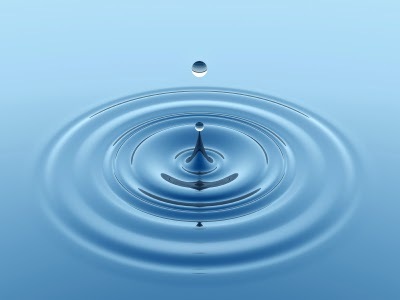 *This post was updated 1 December to reflect Comment 1 by Greg D.
Time for 'Jack & Ran'? Here on HTBS we have written a lot about British Olympic rowing champions. Lately, our favourites have been Bert Bushnell and Dickie Burnell, who took the gold in the double sculls at the 1948 Olympic Games, and, in the same Olympic regatta at Henley, Ran Laurie and Jack Wilson, who took the gold in the pair. In 2012, there was a brilliant film made about Bert and Dicke, and now it is time to push for a film about 'Jack & Ran'. Not only did this pair have a tremendous exciting rowing career, first at Cambridge, Ran at the 1936 Olympic Games, then both at Henley in 1938, and again at Henley in 1948 (during these ten years they hardly looked at an oar), and finally at the 1948 Olympics, they also had thrilling adventures in Sudan - everything to make it more than just a rowing movie. Is there anyone out there who needs help with the film script? There is now a short film clip on Youtube how Laurie and Wilson won the Olympic gold medal, watch it here. 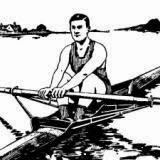 On 25-26 August, 1900, was the first Olympic rowing regatta. Saint George Ashe of Thames RC wrote history when he, as the first Englishman, represented his country in the first ever Olympic rowing regatta, held on the river Seine in Paris. (There was supposed to have been a rowing regatta at the Olympic Games in Athens four years earlier, but it was cancelled due to bad weather.) 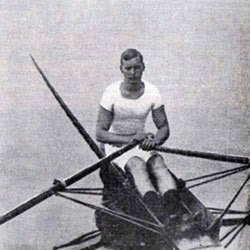 Saint George Ashe, who was the only English oarsman competing in Paris, easily won his first heat in the single sculls. 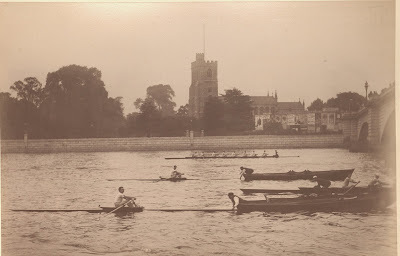 In the third heat, Louis Prével, who had rowed in the Diamond Challenge Sculls at Henley earlier that summer, just like Saint George Ashe who was the runner up that year, won his heat. Both scullers advanced to the semifinals. In his semifinal heat, Ashe came in third, which technically meant that he was kicked out of further advancement. However, he protested – no records are telling us why – whereupon the French organisers allowed him to advance to the final. Prével also won his semifinal heat and proceeded to the final, where he was interfered and capsized before crossing the finish line. The Frenchmen Hermann Barrelet and André Gaudin took the Olympic gold and silver, respectively, while Ashe took the bronze medal – Great Britain’s first rowing medal in the Olympic Games. Although, it is probably more correct to say that the Englishman took the third place as no bronze medal was handed out at the Olympics at that time. Saint George Ashe competed several times in the Diamonds, but never took the cup. 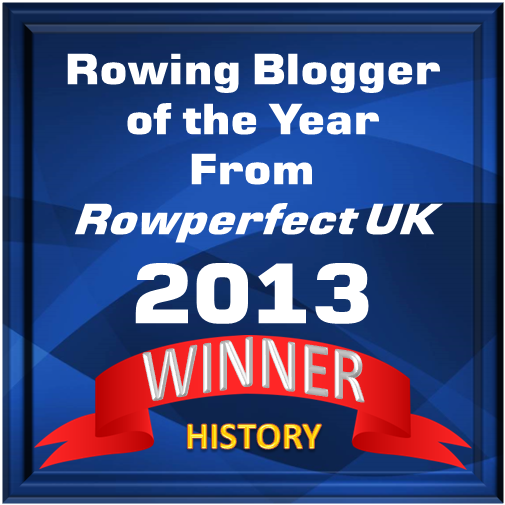 He did, however, take the Wingfield Sculls in 1904. Read more about him here (correction, he was 51 when he died, not 49 as the Wikipedia text says). 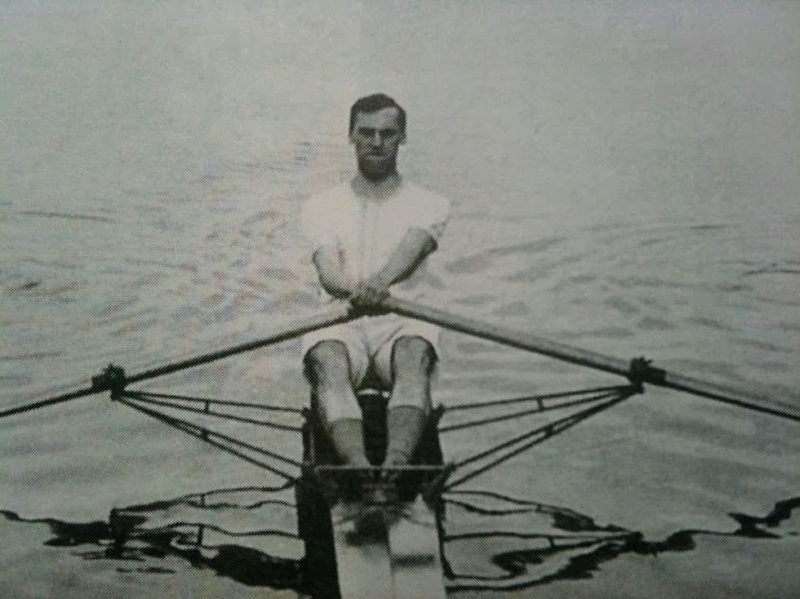 *There seems to be no photographs of Saint George Ashe, therefore a picture of the first Olympic champion in the single sculls will have to do! Right now there is an interesting interview with Jean-Christophe Rolland (photo on the right ©Igor Meijer/FISA) on the World Rowing’s website. 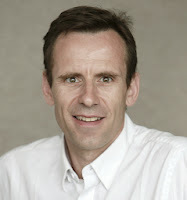 In July 2014, Rolland will become the new president of FISA, the international government body for sport of rowing. Read the interview here. *Note: On 17 October Mystic Seaport’s Shipyard staff stepped the first of the 1841 whaleship Charles W. Morgan’s three masts, the foremast - seen in the photograph on top (Courtesy Mystic Seaport, photographer Andy Price). 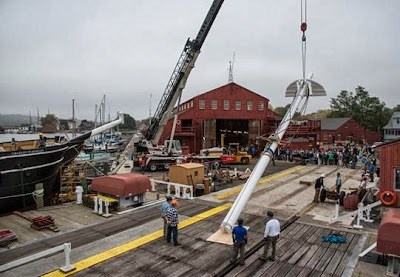 The vessel was de-rigged and had her masts and spars removed at the restoration of the whaleship that started in November 2008. Re-installing the masts, known as “stepping” in nautical terminology, is an important occasion during a ship’s construction. Today, the Morgan’s two remaining masts, the main and the mizzen, will be re-installed at the Museum’s Shipyard. The start at the 1898 Wingfields. Closes to the camera is Harry Blackstaffe (Vesta RC) and in the background his opponent, Hunting Howell (Trinity Hall). It is 25 July, 1898, and the location is the River Thames above Putney Bridge. Harry Blackstaffe (Vesta RC), the holder of the Wingfield Sculls, the amateur championship of the Thames and Great Britain, is getting ready to defend his title against B. Hunting Howell (Trinity Hall, Cambridge), who three days earlier had won the trial heat by beating C. H. R. Thorn of London RC. The day before the trial heat, 21 July, Blackstaffe had taken the London Cup at the Metropolitan Regatta. The previous year, Blackstaffe had easily won his first Wingfields in 23 minutes 58 seconds, four lengths in front of Howell, who was six lengths ahead of A. F. G. Everitt (London RC). 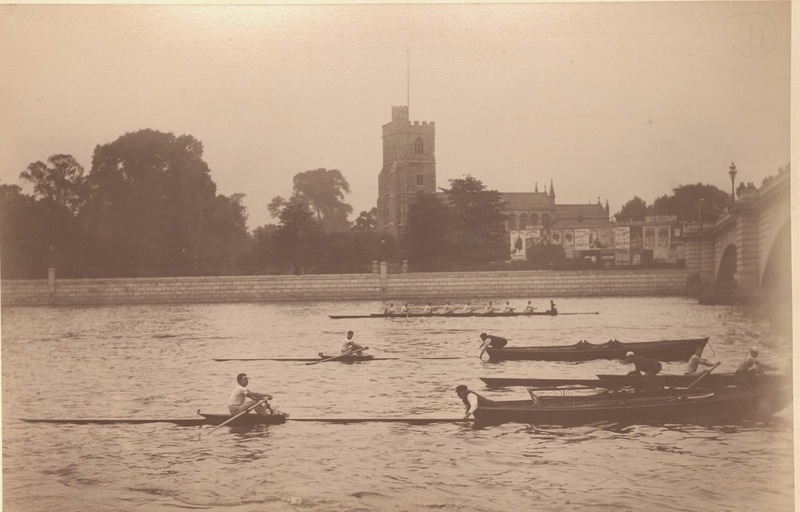 In the photograph on top, Blackstaffe is closest to the camera and in between the stake boats we can see the Vesta oarsman’s pilot boat, an eight, getting ready to follow their man and ‘pilot’ him the whole championship course from Putney to the finish line at Mortlake. In the background are Howell and his pilot boat. As usual the pilot boats are missing their bow men, instead the ‘pilots’ have taken that seat and will face forward to guide their scullers over the course. The race ‘produced a most extraordinary contest’ The Times wrote in a report the day after the race, on 26 July. Blackstaffe went out quickly at the start and got a good lead, while Howell, or as The Times wrote, ‘the Cantab’, was not used to the quick tide at Putney Bridge. At Putney Reach, Blackstaffe was two boat lengths ahead, which at the Mile Post had become three and a half lengths. Passing the Hammersmith Bridge, the Londoner’s time was 8 minutes 53 seconds while Howell’s was 9 minutes. At Barnes Bridge, Blackstaffe was four lengths in front. To the on-lookers, including the umpire Gilbert Kennedy of Kingston RC (winner of the 1893 Wingfields) on the paddle steamer that followed the race, it looked like the sculler from Vesta RC had the championship title in the bag. With half a mile to go, Blackstaffe began to look a little unsteady in his boat and had a slight problem with his steering, but Howell was still three lengths down. Suddenly, the Hall man began a tremendous spurt, rapidly gaining on Blackstaffe, who could not respond and was ‘quickly failing in strength’. All of a sudden, the Vesta man stopped rowing with 50 yards to go, totally exhausted. Howell passed him, got a couple of lengths lead, and stopped rowing, too, all pumped out. Nonetheless, the speed of his boat took him over the finish line in the new record time of 22 minutes 57 seconds. This was the second time a Trinity Hall man had won the Wingfields. The first one was James Bayford, who was the first winner of the Henry Wingfield’s Silver Sculls in 1830. James’s brother, Augustus Fredrick Bayford, who also rowed for the Hall, was in the first Cambridge crew in the Boat Race in 1829. The cover of the Swedish rowing magazine, October 1991: in their boat Joyride, Johan Flodin, in the stroke seat, with Bo Ekros, Per Lundberg and Joachim Brischewski, the Swedish crew who took silver medals at the World Championships in 1991 and 1992. I was happy to read that a countryman of mine, the Swede Johan Flodin (pronounced: Yohan Flu-deen, stress on the second syllable in his last name) has been named the 2013 World Rowing Coach of the Year by FISA. Although a Swede, Johan received the award as the coach for the Norwegian men’s double sculls (Nils Jakob Hoff and Kjetil Borch) and the lightweight men’s double sculls (Kristoffer Brun and Are Strandli), two crews who became world champions at Chungju in South Korea earlier this year. Johan was a very successful rower in Sweden back in the day. He has several Swedish championships under his belt and in both 1991 and 1992 he, Bo Ekros, Per Lundberg and Joachim Brischewski took silver at the world championships in the lightweight quadruple scull. 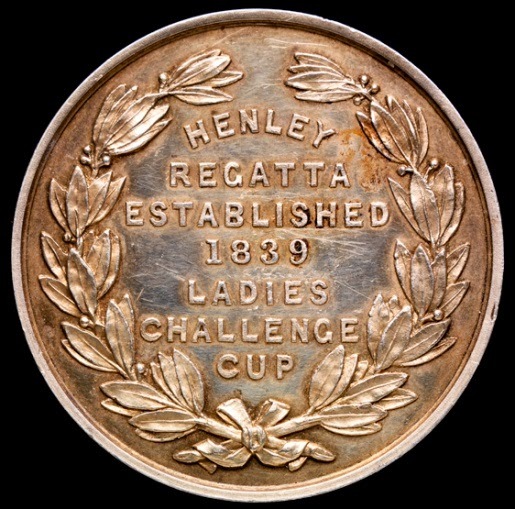 In 1992, they also took the Queen Mother Challenge Cup – the first Swedes to ever take a cup at the Henley Royal Regatta (Swedish crews have competed at Henley before, of course, some of them reaching the final, but never won; maybe the most famous crew being Three Towns RC, who lost the Grand to Centre Sportif des Forces de Armee, France, in 1956). Johan was also racing in the Swedish quadruple scull who placed sixth at the 1996 Olympic Games in Atlanta. Although, Johan has never had a full-time paid position as a coach before taking on the Norwegian National Team in November last year, he coached Frida Svensson for several years which gained her the world title in the single sculls in 2010. While an active rower in Sweden, Johan rowed for Strömstads RK, a rowing club in the small town of Strömstad on the Swedish west coast, close to the Norwegian boarder. 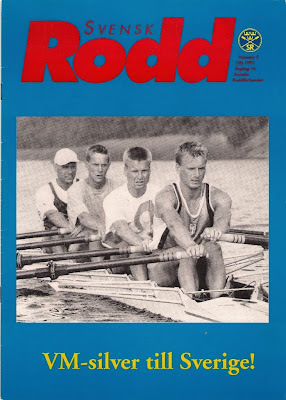 Later, in Strömstad, Johan was the head master for a high school/junior college, which had a special rowing programme for high-level rowing juniors, many of whom have represented Sweden at international regattas like the Junior World Championships, etc. Read what World Rowing wrote about Johan, who gave a talk at the World Rowing Coaches Conference in Tallinn, Estonia, the other day, here. the rower oared past the foot of. all the time the rower was out. The Cenotaph in London, the United Kingdom’s primary national war memorial. In years gone by, men raised their hats when passing it. Picture: Arpingstone/Wikipedia. The 11th November is a memorial day observed in many countries around the world to remember the members of their armed forces killed in war. While the poignancy of remembering on the 11th hour of the 11th day of the 11th month is very obvious, in some nations the day on which the major ceremonies of remembrance take place has shifted over the years. In the United Kingdom the main observance is now on Remembrance Sunday, the second Sunday of November (though observance of the two minutes silence on the 11th seems to have increased in recent years). Australia has joined New Zealand in putting more importance on ANZAC Day, 25th April. While the United States observes Veterans’ Day on 11th November, it is Memorial Day in May that is now the focus of national observance. Canada keeps the 11th November as Remembrance Day and as a national holiday. ‘Poppy Day’ is especially relevant here as it was a Canadian, John McCrae, who wrote the poem, ‘In Flanders Fields’ which resulted in the poppy becoming the powerful symbol that it is today. Hugh Riviere’s In The Golden Days which forms part of the War Memorial at Thames Rowing Club. The Monument Australia website is a historical and educational research site which records the public monuments and memorials in all Australian States and Territories under various themes.... Monuments and memorials reflect important values within the community.... and this website aims to help in the preservation of this aspect of the cultural history of Australia. Naturally, I put ‘rowing’ in to the search facility and, while many results were not relevant, there were five rowing club War Memorials that could be termed ‘Cenotaphs’, all from the state of Victoria. 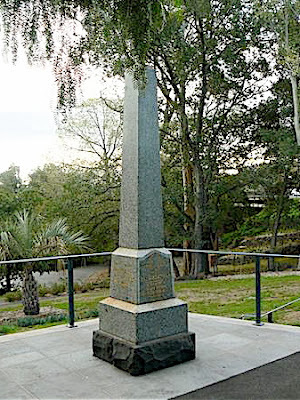 The Barwon War Memorial. Picture: Nancy Alford/Monument Australia. 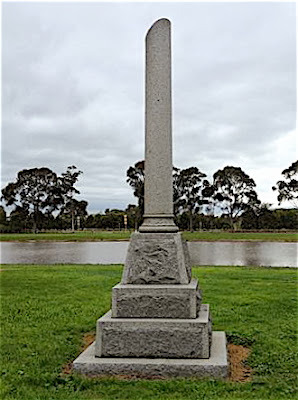 A broken column is the memorial for Barwon Rowing Club. It can symbolise a fallen leader or unfinished work and was used on tombs for those whose life was deemed cut short. 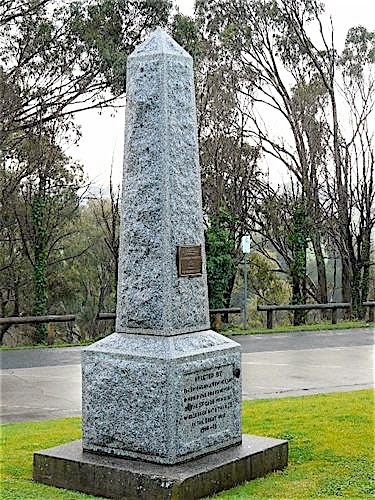 The Bairnsdale Memorial. Picture: Graeme Saunders/Monument Australia. The Bairnsdale Rowing Club War Memorial is an obelisk dedicated to the fifty-seven enlisted and fallen members of the Club who served in the First World War. The Hawthorn’s Memorial. Picture: Kent Watson/Monument Australia. A blunt and stereotypical Australian inscription on the Hawthorn Rowing Club memorial states ‘They fought. They fell’. Alexandra Gardens showing the Yarra River & Melbourne City Skyline. The Judges’ Box mentioned below is on the far end of the left bank. Picture by Donaldytong/Wikipedia. The city of Melbourne has two monuments to fallen oarsmen and they are both, I think, unique. 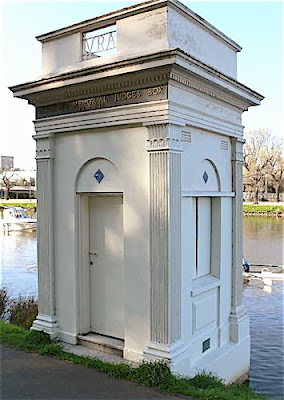 They are the Victorian Rowing Association Memorial and the Victorian Rowing Association Judging Box. Both are situated in Alexandra Gardens on the south bank of the Yarra River. This is Australia’s equivalent to Philadelphia’s Boathouse Row or London’s Putney Embankment as it is home to seven rowing clubs. They are Melbourne University BC (1859), Melbourne RC (1862), Richmond RC (1863), Banks RC (1865), Yarra Yarra RC (1871), Mercantile RC (1880) and La Trobe University RC (1969). The Henley-on-Yarra Regatta started here in 1904 and, until the Second World War, was a very important rowing and social occasion with attendance peaking at 300,000 in 1925. Film evidence from 1933 is here. Boathouses along Alexandra Gardens. Picture: Tony Hodder. The Victoria Rowing Association Memorial lists 320 rowers from 30 Victorian clubs who died in the First World War. There were 2,100 members of the VRA in 1914 and more than half of them enlisted. Of these, nearly a third were killed. The monument has been recently restored and a rededication service was conducted at the Australian Henley Regatta on 23 February, 2013. The VRA ‘Oarsmen’s Cenotaph’. Picture: Tony Hodder. Hopefully the 1914-1918 Oarsmen’s Memorial Judges’ Box just down from the boathouses near the finish line of the regatta will soon merit restoration as well. The 1930 built Judges’ Box. Picture: Graeme Saunders / Monument Australia. The Box shows its age. Picture: Tony Hodder. As an aside, there is an interesting (though not absolutely proven) story surrounding the timing of the formal ending of hostilities on 11th November 1918. The Armistice was signed in a railway carriage, 60km north of Paris. Britain’s official delegate, Admiral Sir Rosslyn Wemyss, was ordered by Prime Minister David Lloyd George to have the end of fighting set for 3pm to coincide with a sitting of the British House of Commons. This would allow Lloyd George to theatrically make the announcement to an assembled and expectant Parliament and to bask in the reflected glory of victory. Admiral Wemyss allegedly thought that the delay would cause more unnecessary killing and felt that 11am, ‘the eleventh hour’, had a certain pathos. He was right. 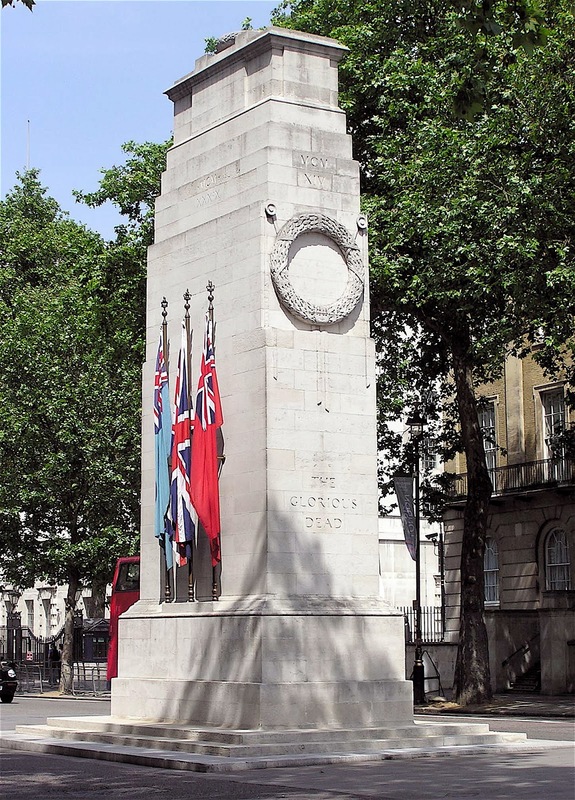 *Cenotaph: A monument erected in honour of a person or group of people whose remains are elsewhere. This photograph shows “Checchin”, who last month turned 100 years old. 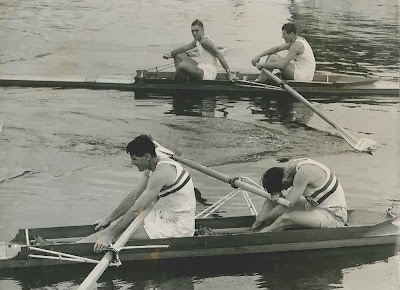 He is the last of the 1936 rowing Olympians who is still alive (“Checchin” is the handsome-looking fellow on the right). The always reliable Greg Denieffe found some information about Checchin’s party on Tuttolevante’s website. Under the headline “The Argus Rowing Club celebrated the centenary of Checchin“ the article states there was a big party at the Argus Rowing Club of Santa Margherita, in Costa Domitius, for the centenary of Checchin, the dean of Italian rowing, who is now an honorary member of the rowing club. One hundred fifty people attended the party, including the mayor of the town, Roberto De Marchi, who gave Checchin a beautiful plaque. The ‘birthday boy’ was only supposed to have stayed for a short while, but enjoyed himself so much, he stayed for a couple of hours. Read the whole article here (in Italian). Francesco Pittaluga, Checchin, sitting in the center, with a plaque which was given to him by the mayor of Santa Margherita. Taking a look at Checchin’s rowing career, his four took a fourth place in the Berlin Games after Germany (gold), Great Britain (silver) and Switzerland (bronze). Checcin rowed in the four with his uncle, Antonio Ghiardello, and his cousin, Louis Luxardo, and Aldo Pellizzoni. 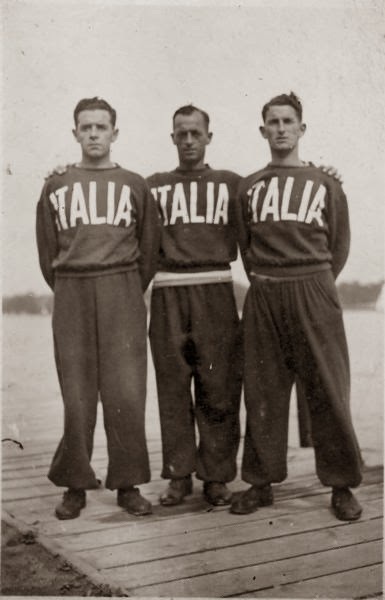 Two years later, at the 1938 European Championships in Milan, Checcin rowed in the Italian crew who took a silver in the four without/coxless four. Other members in the crew were, Luigi Luscardo, Gaetano Petrucci and Agostino Massa. (Some sources say that Checchin also took a bronze medal at the 1937 European Championships at Bosbaan in Amsterdam, but then it must have been in the coxed four as Italy did not have a crew in the coxless four at these championships. I am afraid I have not been able to track down the names of the medallists in the Italian bronze four.) After the Second World War, Checchin returned to Argus to pass on his passion for rowing to the younger generation as the club’s coach. You will find more information about Checchin here (in Italian). 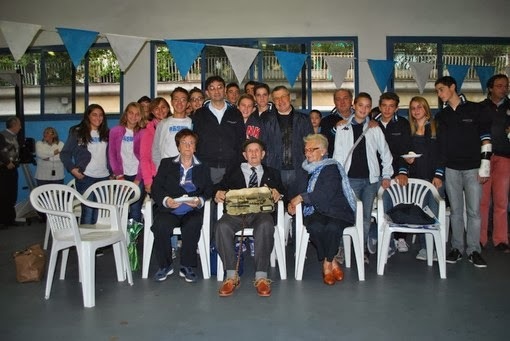 HTBS would like to send Mr. Francesco Pittaluga, “Checchin”, our warmest belated congratulations on his 100th birthday and at the same time thank Cesare for sharing the information about the last surviving rowing Olympian from the Berlin Games. Thank you also to Greg! A new Sporting Memorabilia sale by Graham Budd Auctions took place in Sotheby’s, 34-35 New Bond Street, London, on 5 and 6 November. The full catalogue is online and as in recent sales, there were a few lots (240-245) of interest to collectors of rowing memorabilia. Undoubtedly, the star ‘rowing’ item was a Ladies’ Plate Medal won by F. S. Kelly in 1899. Early in 2012, HTBS reported that Kelly’s Pineapple Cup sold at Bonhams for £3,800. This was his prize for winning the 1905 Diamond Challenge Sculls, his third victory in four years. His first win in the Diamonds was for Balliol College, Oxford, when he won in 1902 beating Raymond Etherington-Smith in the final. Balliol College has the sculls in their historic collections centre in St Cross Church. The following year, sculling for Leander Club, he retained his title beating Julius Beresford, and in 1905 he defeated Harry Blackstaffe. Not to be outdone, the River and Rowing Museumin Henley has a 1905 scull in their collection. Kelly, a New South Welshman by birth – his father was Irish – also won The Grand Challenge Cup at Henley three times in succession (1903-1906), The Stewards’ Challenge Cup in 1906 and a gold medal for Great Britain at the 1908 Olympics in the eights. He is remembered on the Bisham War Memorial. A very diverse collection that would probably do well on eBay split into individual lots. The Henley booklet is rather grand considering it only consists of 12 pages. I like the composition of this portrait. The decorated oars are clearly important mementos of a rowing career that saw victory in the 1947 University Boat Race (Cambridge) and The Grand Challenge Cup in 1948 (Thames Rowing Club) and participation in the 1948 Olympic Games (Great Britain 4-). My first thought on seeing this picture was that Cyril Bird would have enjoyed it. He used the pen name ‘Fougasse’ and in 1948 had a cartoon published in Punch with the caption "Yes, I did row a little at one time – why, how did you discover that?" Perhaps Oscar Wilde was right, when he opined in his 1889 essay The Decay of Lying that, “Life imitates Art far more than Art imitates Life”. All but Lot 245 sold to room bidders. Cambridge Presidents Steve Dudek and Esther Momcilovic, and Oxford Presidents Maxie Scheske and Malcolm Howard at this year’s Challenges at the office of title sponsor BNY Mellon. Photo: the BNY Mellon Boat Race website. On 24 October, the Official Challenges of The BNY Mellon Boat Race and The Newton Women’s Boat Race were issued by Cambridge at the Autumn Reception. The event acknowledges the start of The Boat Race season. All four of the Club Presidents and some members of The 2013 BNY Mellon Boat Race and The Newton Women’s Boat Race squads attended, marking the second year of parity for the Women’s clubs, which are just one year away till their race relocates to the Tideway, in 2015. The official challenges are laid down at the start of every season by the previous Race’s losing University Boat Club President to the President of the victorious Club. Both the Oxford Men’s and Women’s Blue Boats triumphed in the 2013 Races, so it was up to Steve Dudek and Esther Momcilovic of Cambridge to issue the Challenges on behalf of their clubs. The reception was held at the offices of the title sponsor, BNY Mellon, and as well as marking the start of the season, the evening was also an opportunity to celebrate the launch of official partner, JeanRichard’s new limited edition Boat Race watch. The evening was also supported by official partners, Bollinger, which provided the champagne reception, and Hackett. Curtis Arledge, vice chairman and chief executive officer of the Investment Management, BNY Mellon, commented: “We are pleased that our continued commitment to supporting The BNY Mellon Boat Race will ensure that this historic rowing competition, now in its 160th year, will enthral an expanding global audience for many years to come. The focus, integrity, teamwork and excellence demonstrated by the crews are values that are aligned with our organisation and its commitment to our clients and local communities across the world”. The 2014 BNY Mellon Boat Race will take place on Sunday 6 April, 2014. The Newton Women’s Boat Race will take place a week earlier in Henley, on Sunday 30 Mach, 2014. 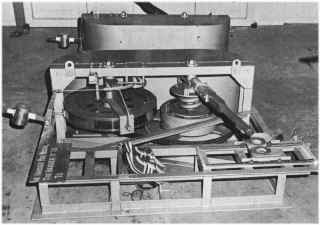 Australian “Ergometer” from the 1960s – from the section “The Development of Rowing Equipment” on the website Friends of Rowing History. 'From Australia we are horrified to hear that professor Frank Cotton, The professor at Sydney University, has produced a specially designed rowing machine called Ergometer. Two nice-looking chaps with moustaches: A. H. Cloutte and J. Beresford, with the 'demon' attacking the strokeside oar. 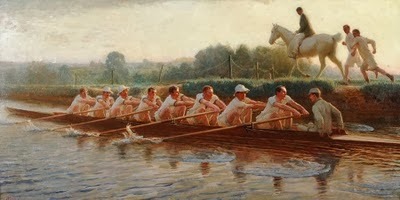 Despite that, the Thames oarsmen did not have a problem winning the 1911 Silver Goblets. Today it’s the first of Movember, the first day in the month when we are to celebrate the moustache. Well, it’s actually a global campaign to raise funds for men’s health, especially to fight prostate and testicular cancers. Celebrating Movember has been a great deal among rowers, men and women, in Great Britain, and British Rowing has stood behind the campaign in earlier years and is doing so again this year. 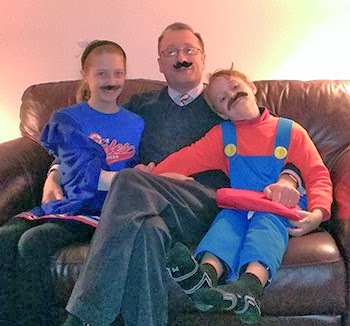 However, the Mo-Movement is growing, just like your moustaches should do this month, and more and more men and women are joining in by donating money for this good cause. Here is the official website “Movember 13” in the USA. Just like last year when I wrote about this on HTBS, I had to go back in time to find some oarsmen with some stylish ‘Mos’, and on top you see Arthur Cloutte and Julius ‘Berry’ Beresford (bow) of Thames RC, winners of the 1911 Silver Goblets at Henley. This photograph has been famous as the ‘Demon picture’, a devil ‘attacking’ the stokeside oar. My children and I supporting Movember (photograph taken yesterday, just before Halloween's trick-or-treating).